The Azimut 70’s 22 metres of hull length seem endless in a photograph... and it appears even larger in the water, elegantly reflecting the grace with which it was designed. A revolution that continues to provide new thrills. 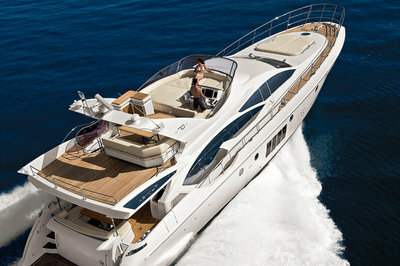 Continue reading for more information on the Azimut Flybridge 70. This sense of grandeur is amplified, when admiring the unprecedented design of the windows that designer Stefano Righini, intended to be "extreme". They are as tall and wide as they are extreme, with a surface of over 15 square metres. 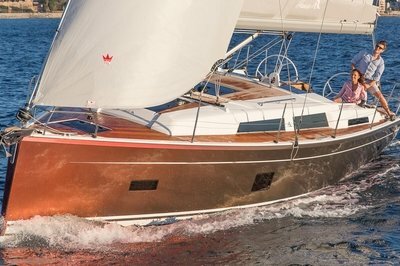 Extreme in design, with their elegant "shark’s fin" that rises from the deckhouse, extending into the perfect elliptical design of the window panes. Extreme also in terms of the amount of natural light that penetrates through them. •	The fly pilot station is equipped with two, 12” Raymarine monitors with option for two, 15.4” displays. •	The 8-person dinette is perfect for plein air socialising. •	The fly is equipped with mini bar, barbecue, and sink. 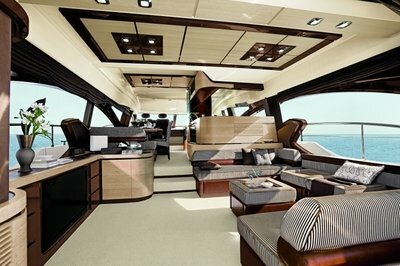 The stern area can accommodate a comfortable chaise lounge or tender up to 2.85 metres. •	The cockpit is extremely generous, providing over 11 square metres of shade for lunch and cocktails/appetizers in total comfort. •	There is a steering joystick in the pilot station for easy navigation and mooring. •	The kitchen covers 4 square meters and accommodates a 28-litre oven and 270-litre refrigerator/freezer and directly overlooks the saloon. •	Materials have been selected with extreme care: generous use of coconut wood in the finishes. •	The VIP and guest bathrooms are tastefully furnished with stylish details. •	The new frontier of plein air comfort. A flybridge which wows you at first sight, a large terrace overlooking the blue sky and sea, 22 metres of magic with graceful, soaring lines. •	A saloon that merges with the sky. The impressively large space and ample windows flow seamlessly into the outside, with elegant minimalist furnishings in pickled oak. Everything is designed to encourage relaxation and enhance the view. •	Five-star accommodations. 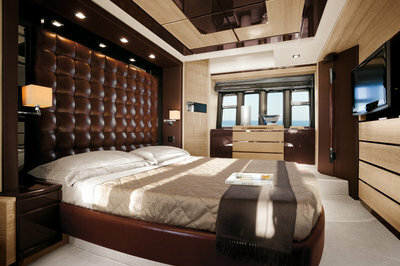 The Boatowner suite offers ample living space, panoramic windows, and a dinette area with integrated vanity. The VIP suite wows for elegance and comfort. The guests are provided with two, beautifully decorated twin bed solutions.